A high level of artistry goes into each and every arrangement I create. Cheesecake? Not my favorite, to be completely honest. I have a hard time with the texture. But Cheese Cake????!!!! 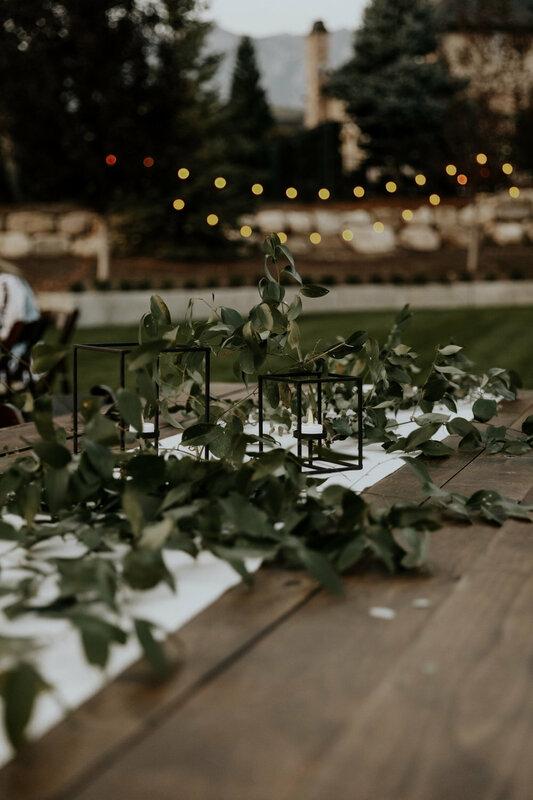 Imagine overlooking the entire valley through a twinkle light 40x70 clear tent with the warm summer breeze blowing through the eucalyptus branches hanging overhead. 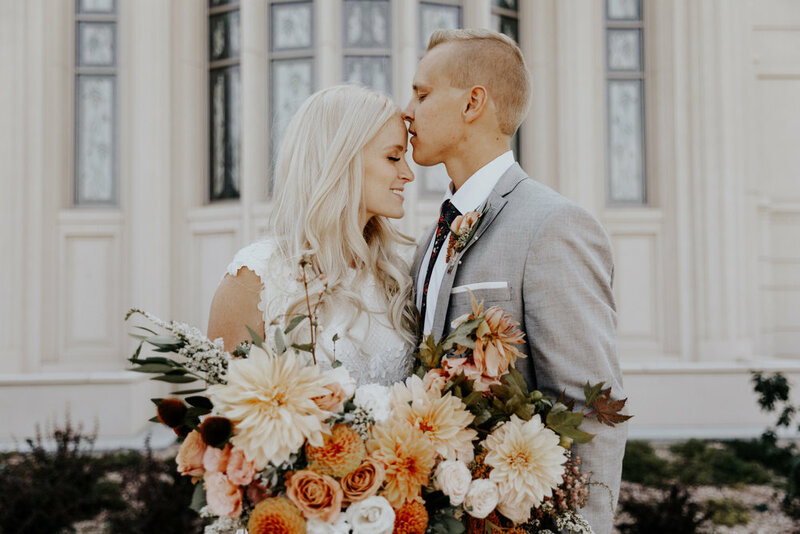 Because I’ll never get over this sweet, gorgeous late summer wedding! Mercedes and Ty are still some of my all-time favorite people and I jump at every chance to see them! Mercedes gown was absolute perfection. Ty’s light gray suite was elegant yet understated. The way they look at each other was indescribable. And the dahlias! Oh. My. Word. If you’re getting married in August or September, you MUST have dahlias! 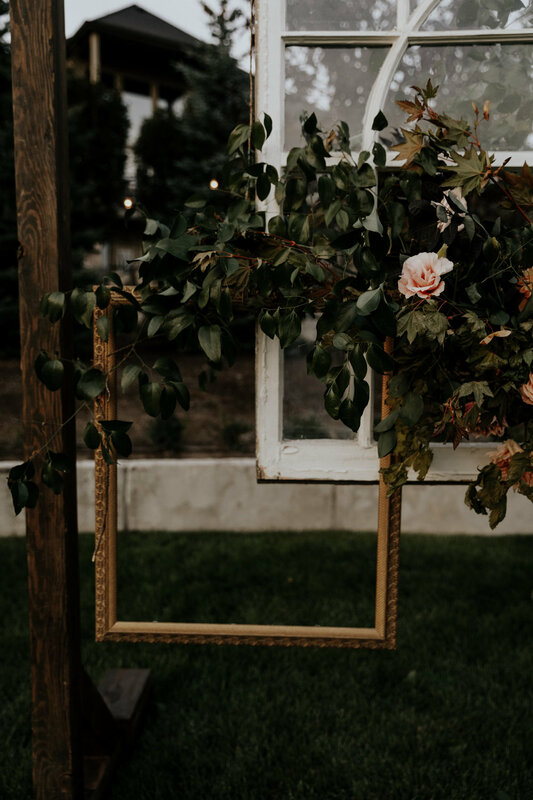 Mercedes wanted to incorporate some antique frames that were meaningful so we created this beautiful backdrop for their ring ceremony. 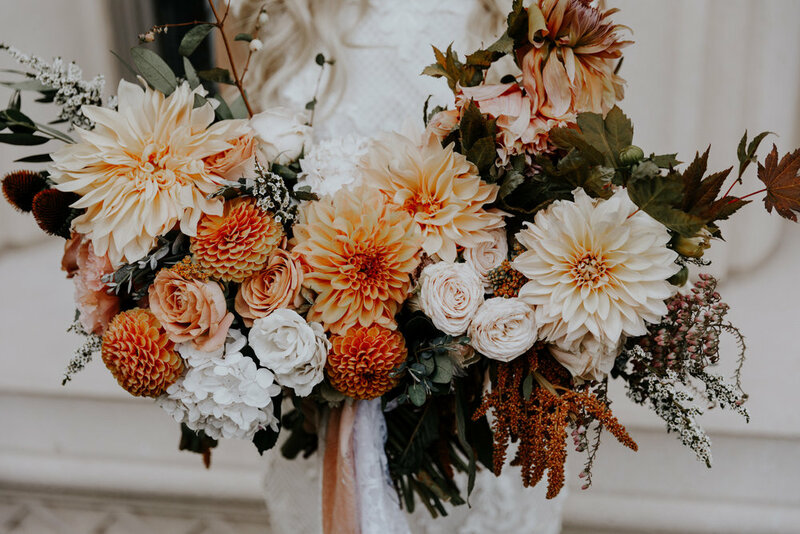 Dahlias galore in muted fall tones with all that lush greenery. Oh take me back! Congratulations to this beautiful couple and thank you for being friends forever! 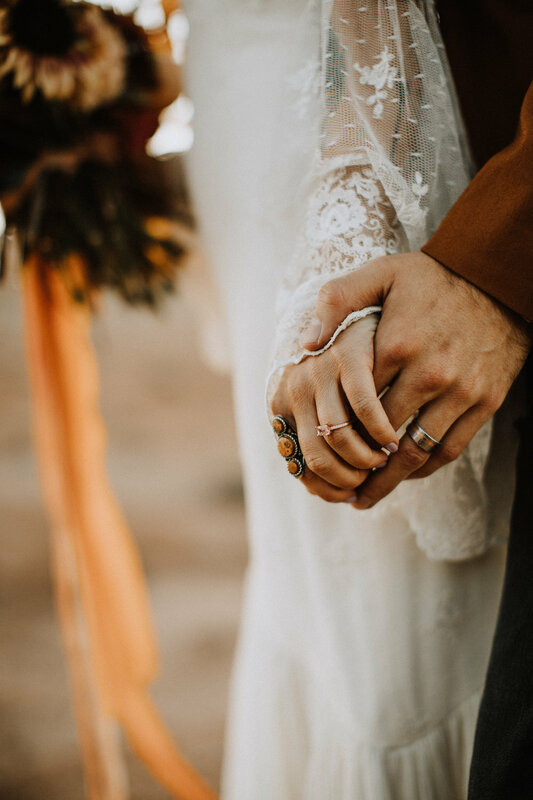 Adventure Weddings? Yes. Yes. And yes. 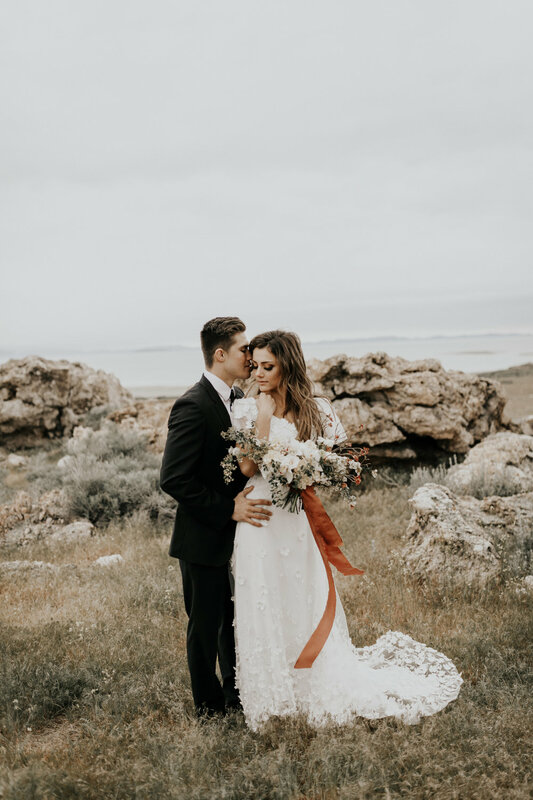 There isn’t anywhere better than Utah for an adventure wedding. The red rock. The cliffs. The mountains. The desert. 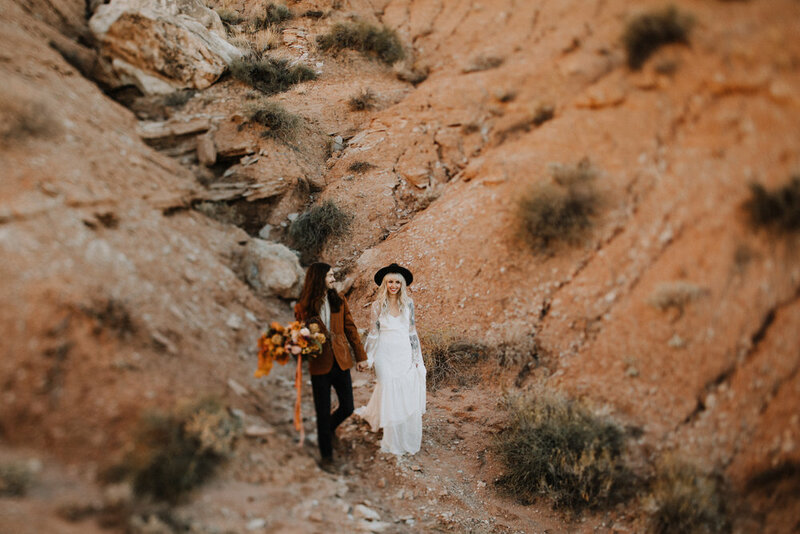 If you’re needing some inspiration, scroll through these gorgeous images and imagine what your Utah elopement or intimate wedding could look like! "The studio space was incredible and Miesh was so great to work with, it's safe to say we all wanted to move in to the space haha! I mean look at all that gorgeous light. 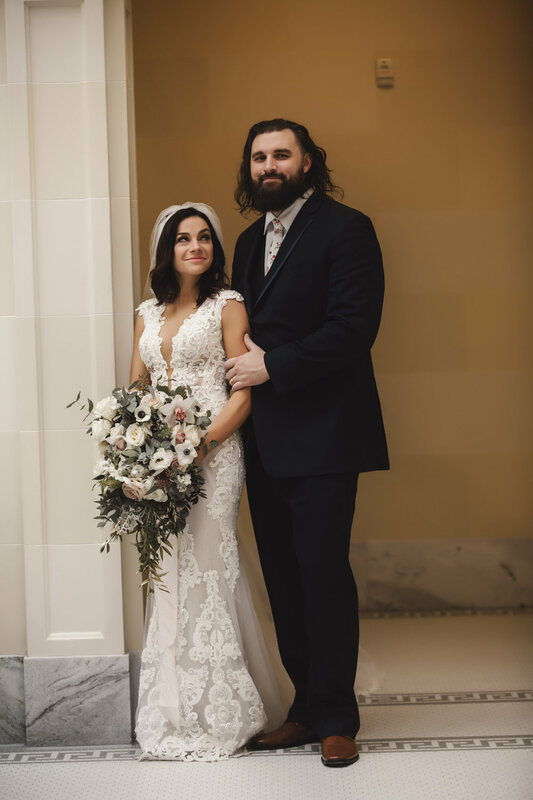 The dress from Made with Love was a dream and everything I could have hoped for, especially on Alyssa!! Which can we talk about how adorable Alyssa + Brandon are? They are total sweethearts and I cannot thank them enough for doing the shoot with us, so THANK YOU Alyssa + Brandon. I loved that Brandon came and hungout while Alyssa was getting her hair and makeup done. Not everyday a guy gets to watch the process. 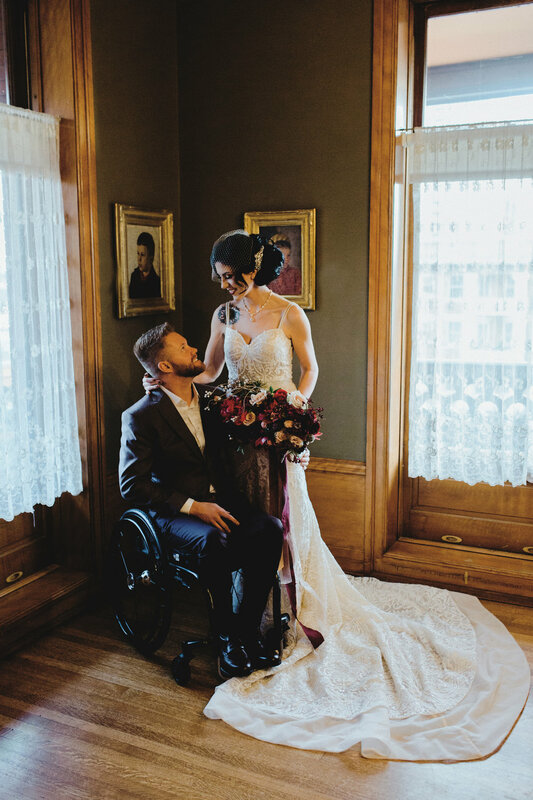 That and you could tell these two were just totally in-love ( all the heart eyes!). As always Olive Avenue had a stunner of a ring that I would be lying if I said I definitely didn't think about taking it home with me! Brandon's tie from Dazi was the perfect addition to his suit as well. I loved how well the colors and pattern went with the florals. Amanda at Sugared Memories created the coolest macrame adorned cake that was a stunner. We added a piece of blood orange that really popped and added just the right amount of texture. The table scape was exactly how I pictured in my head. I loved how the himalayan pink salt and fruit slices added so much texture. 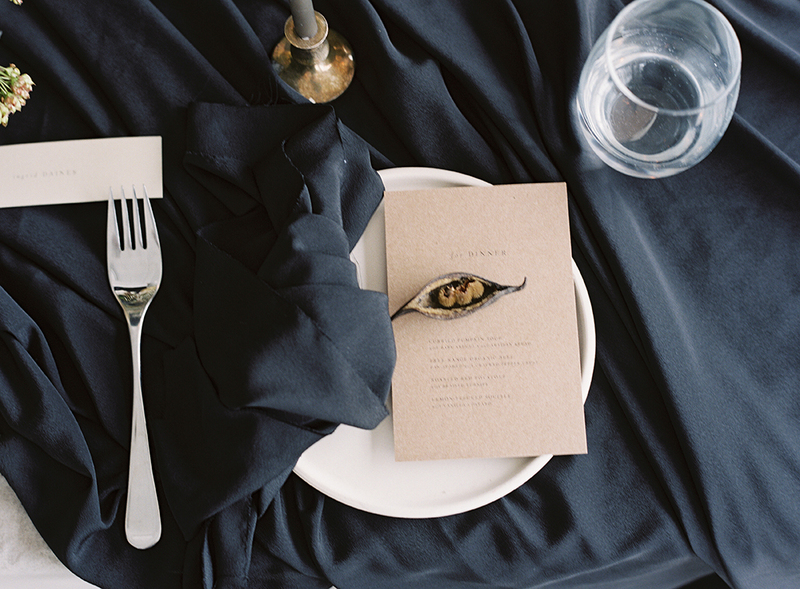 And the ombre napkins added the perfect tie in to the invitation suite Alexis at Darling devotion created. Can we talk about those amazing personal vows. WOW! She is so talented! I ended up brining my coffee table with to use as the table because I wanted to create an intimate lounge/dinner setting. I thought a setting low to the ground with a big rug and pillows would really create that look. 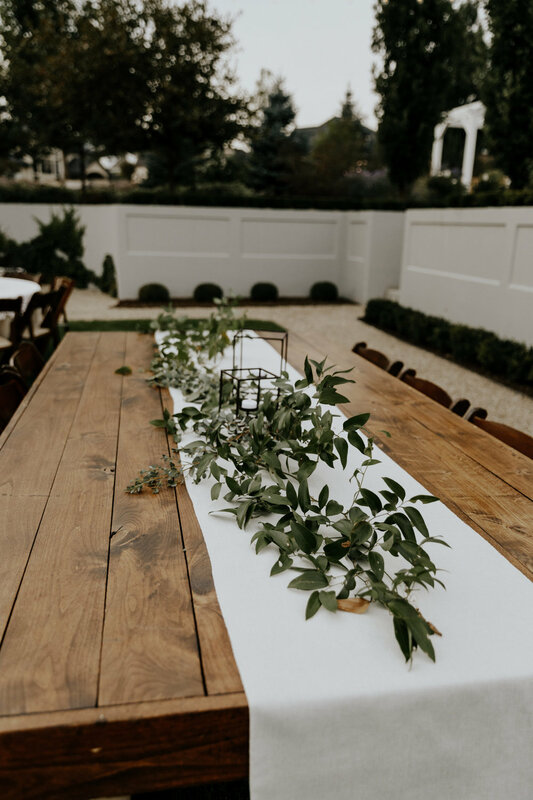 Logan, of The Merchant Collective had the PERFECT pieces to make the space feel bohemian and cozy and created that perfect intimate setting. Logan had the perfect Rug to finish off the backdrop as well. I loved creating the ceremony backdrop, it actually was part of my own weddings decor so it was fun to see it get some time in the sun again. I loved tying in the tassels after seeing what Alexis was creating with the name cards. Mandy of the Potted Pansy created some serious stunners for us. That floral installation and bouquet were so beautiful and the colors were so soft and romantic! 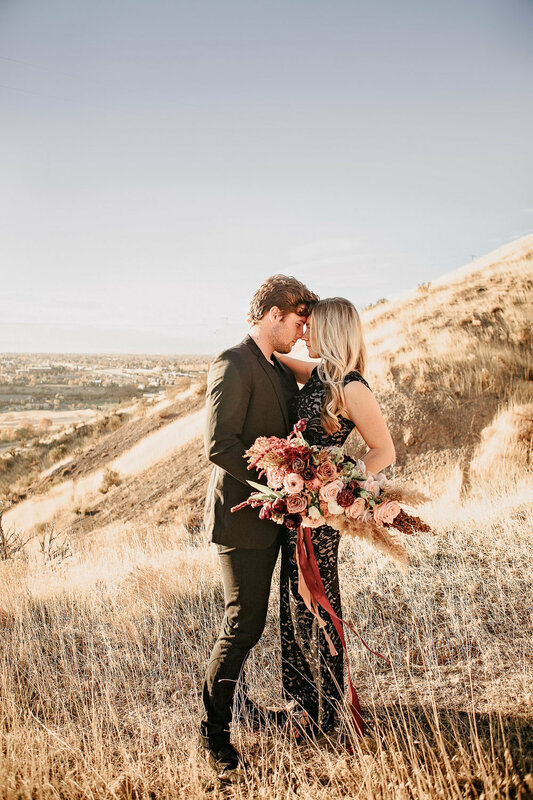 I put my heart and soul into this styled shoot and am so proud of it. It takes a lot of work and moving parts coming together but it's always so cool to see the end result! I also want to say a thank you to my husband for always supporting me, and letting me be creative and do what I need to do when I get an idea in my head! As well as helping me with bringing things to life like the backdrop. A big thank you to Julia Holderness as well, because she gave me more then a few pep talks when I was beyond stressed, and always has such encouraging and real things to say to me. 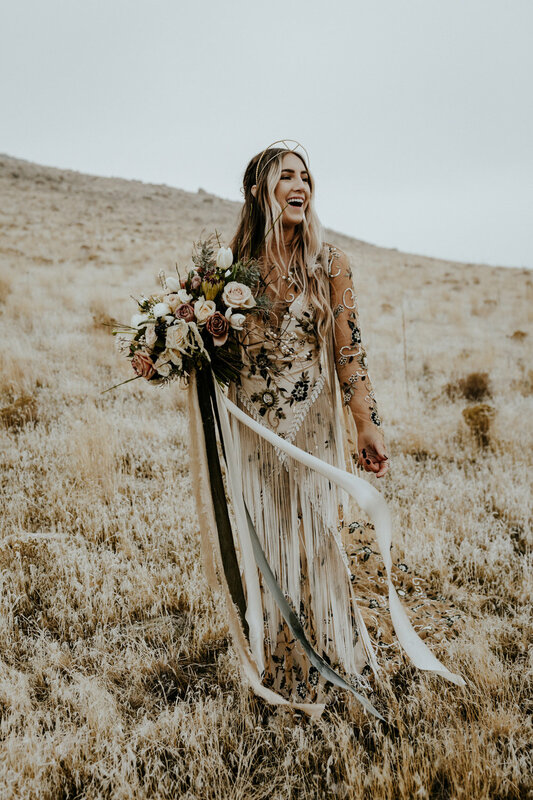 And Last but certainly not least Kylie Liljegren for being such a sweet friend to me since moving to Idaho and willing to literally lend me her wedding dress when things were all a mess. She also connected me to Alyssa + Brandon, so beyond thankful for her. Yep, we all have those moments where we are just grateful. Grateful for those around us who are willing to support and go along with our ideas. Thank you, especially from me, to Peyton, for trusting me to do this...even when she might have thought I was crazy with the hanging piece! I love how it all came together and am so grateful to have been a part of it all! Light. Golden light. Wispy texture that catches that light. 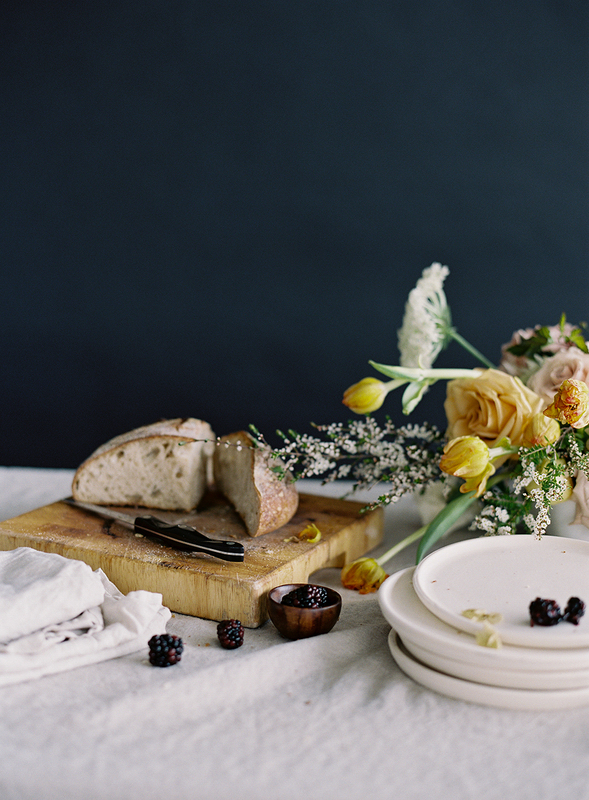 Soft blushes, champagnes, creams and ivories dotted with bits of dry and live florals. 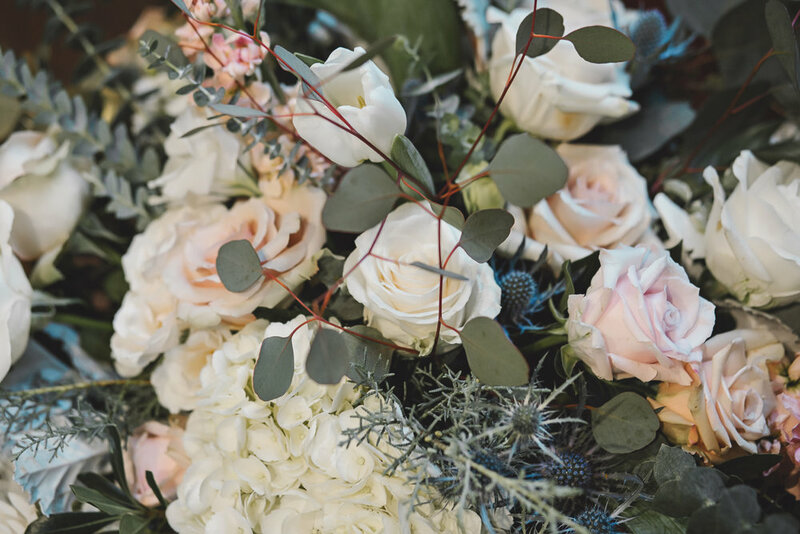 Tulips, dry hydrangea, only the best sahara and quicksand roses (yes, I love their names), blushing bride protea, branches, and my ever favorite desert yearning. And the ever-famous lunaria making an appearance. Sage and Utah brush at it's finest. The slightest glimpse of the lake in the background. Warm summer sunsets and quiet moments together. Hats and gowns that flow in the wind and let the light shine right through them. Ribbon that flows on for days. Simple love. The kind that has been through a bit of a rough patch. The kind that has weathered a few storms. The kind that is deep and strong and not fleeting. It's kind of what I love. Earth. Could anything get closer to what I stand for, love, and talk about? Not really! Earth. It's Mother Nature in all her glory that allows seeds to germinate, flowers to grow, the clouds to cover, the rain to fall, the snow to cover what was and the spring to bring forth what has become. It's Mother Nature who creates splendid sunsets and billowing clouds for us to enjoy. It's Mother Nature who allows spring to turn into summer and summer to turn into fall and fall to turn into winter. And then do it all again. It's Mother Nature who grows imperfectly perfect things all around us. So a full workshop dedicated to her meant living and dry and rock and earth. It meant wood and green and flower and leaf. It meant hard and durable and soft and delicate. And it meant the perception of life. 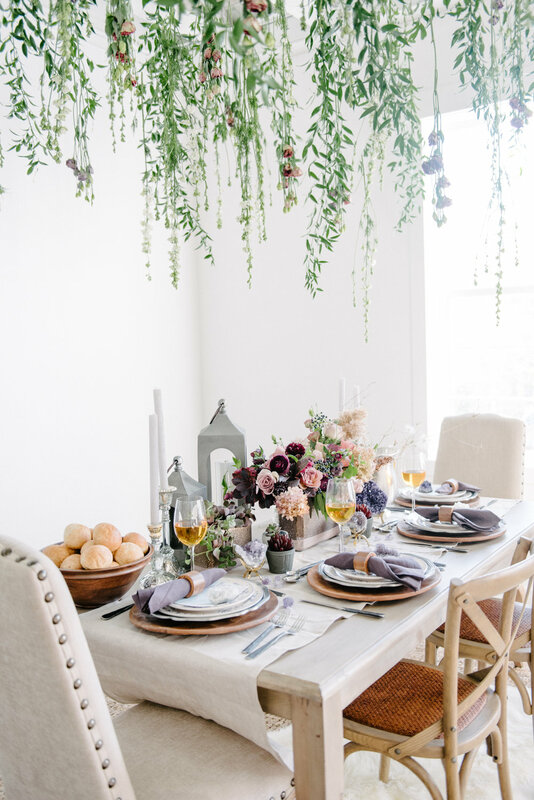 Amethyst rock, geode decor, wood flooring and chairs, hanging greens, and the delicate balance of what was once alive. That is what Earth became. Elegance and Grace. Line and Movement. That is what takes place when a beautiful dancer takes hold of a linear bouquet and dances her way around the sandy ground at Saltair. The way Katrina moved with this bouquet was timeless. Her extension of the lines and the way the bouquet became a part of her was magnificent. I was speechless when I saw the first images and still feel that I'm at a lack of words. The beauty speaks for itself and so does this wonderful dancer. 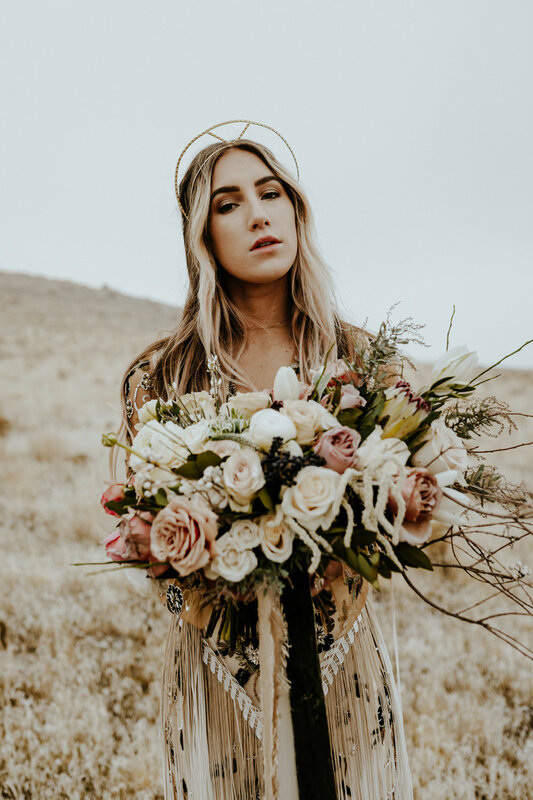 To all the boho brides out there, I'm just saying do things your way! If you want boho, do it! If you want wild, do it! If you want non-traditional, who's saying you can't?! 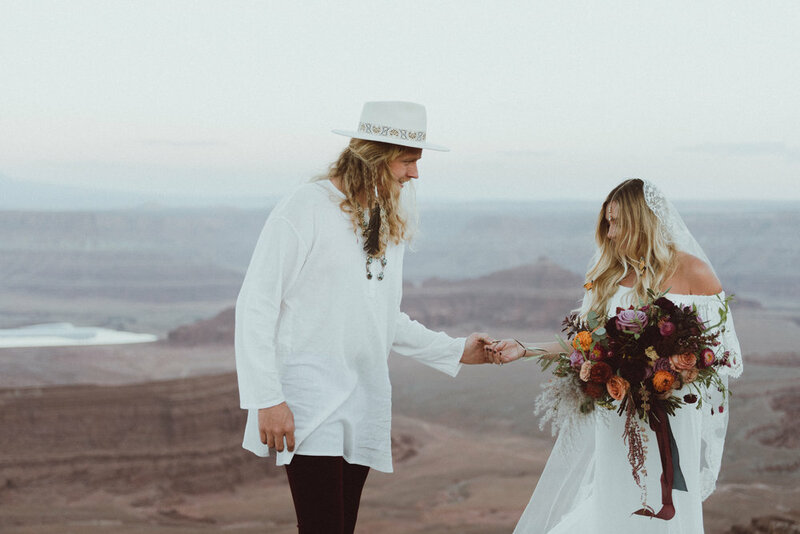 These two are the epitome of boho style. 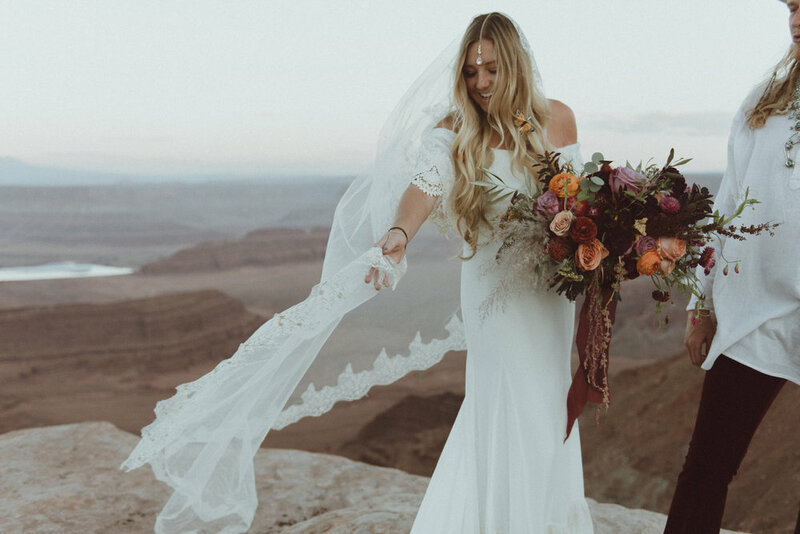 I mean, I have had so many brides come to me saying they want boho, but nothing like this. Nothing THIS boho. Nothing this through and through bohemian. And not because it's a trend. Not because others are doing it. Simply because this is exactly who they are. Stephanie and Asa, thank you for doing things your way, no matter what anyone else had to say about it! 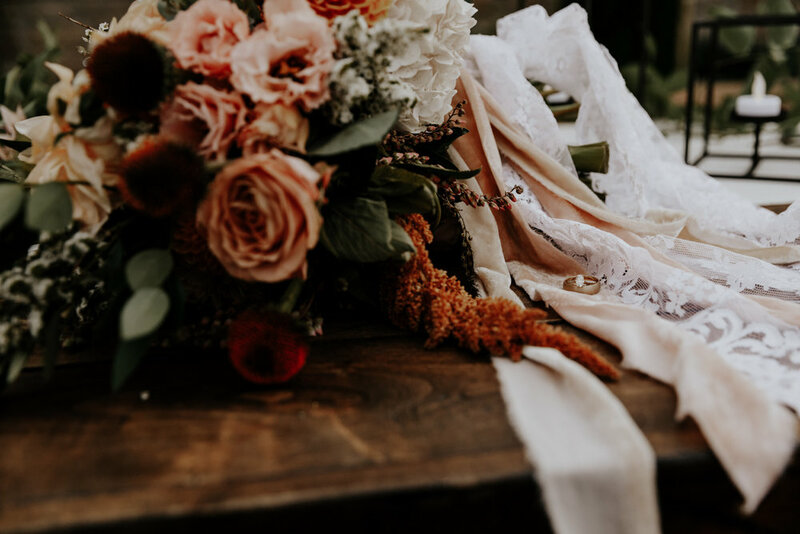 This wedding was so gorgeous that I struggle to even find words to describe it. First of all, Delia is the most stunning human being and the sweetest of souls. I was delighted to work with her and humbled by her kindness and thoughtfulness, with all those around her. The fact that she is an official Ford model helps a bit too! LOL. These two lovebirds met while vacationing one year in Mexico. 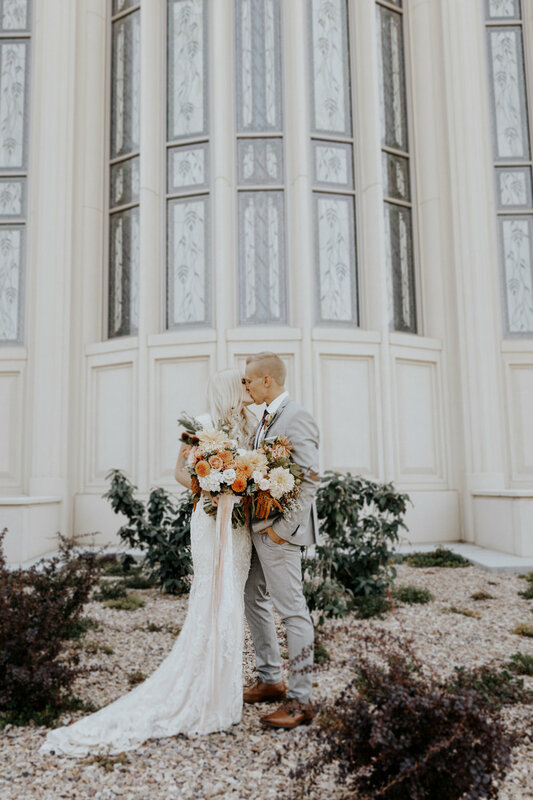 If I recall correctly, the one or the other was already dating someone, so the friendship remained as such until a few months later when, Delia reached out to Dylan asking a few questions and mentioning that she had recently been baptized into the LDS Church. Well Dylan was a member of the church too, so win to the start of their relationship. 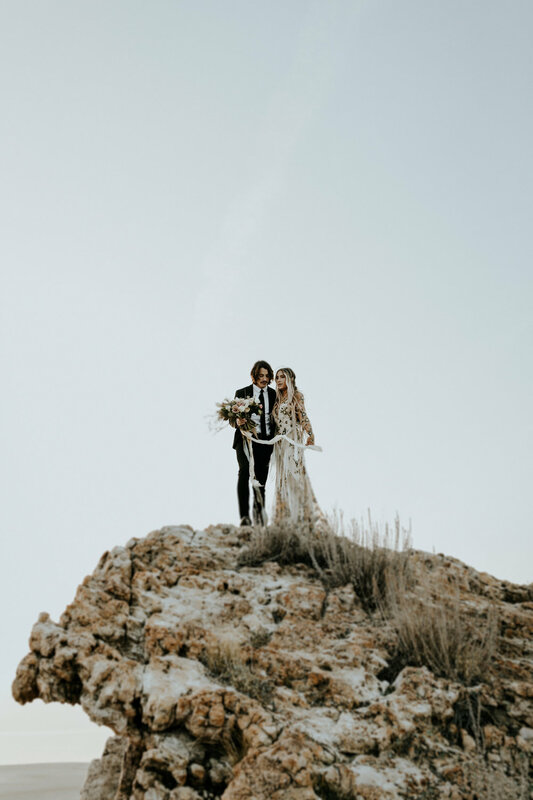 Over long distance and lots of time, traveling back and forth from Utah to Arizona to all over the world, these two dated and when the deal became official, Delia reached out to me. In all reality, the wedding that we pulled off was not the wedding Delia had originally wanted. 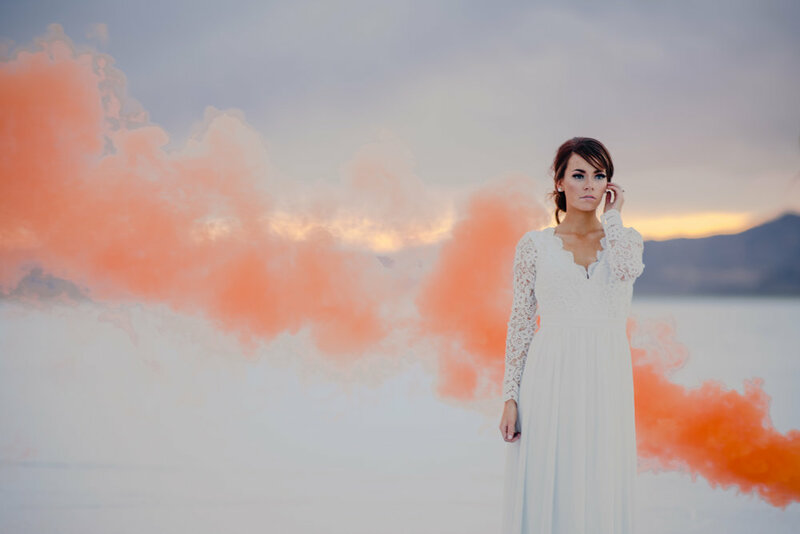 Her dream wedding was in a completely different color scheme and we planned out the wedding as such. It was beautiful. But I could tell there was something holding Delia back. Something just wasn't quite right. Then one day, she emailed me with an image from my instagram feed. This she said, was what she really wanted. This she said, was her. This she said, made her happy. The colors were bright and spring and fun. But that bouquet that she loved was a spring bouquet. With spring flowers. Which were not going to be available during her October wedding. So what do you do as a florist? You modify! This is what a florist does and this is the fun part!!! 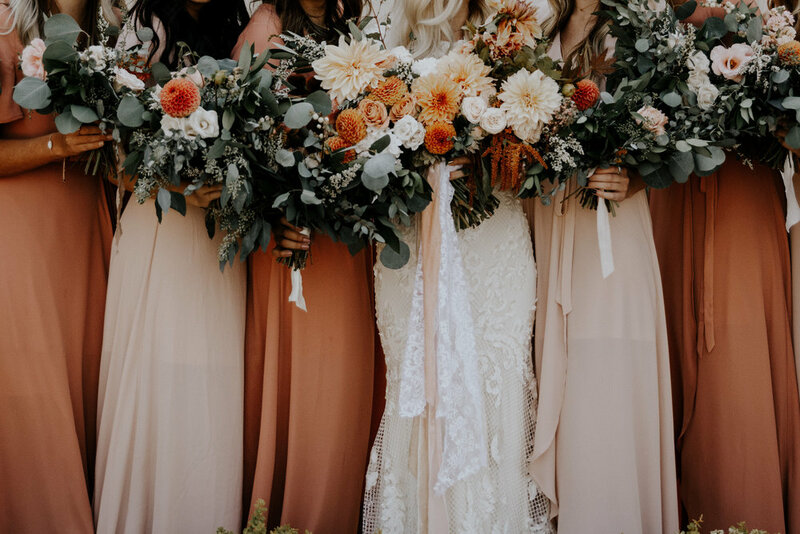 What flowers can we use that are available during this time of year in this color palette and overall feel? Well for this particular wedding, dahlias were the answer! And locally grown dahlias are the very best! A huge thanks and shout out to Poppin Blossoms Farm for the dahlias! Delia looked like a princess and I hope she felt like one too! 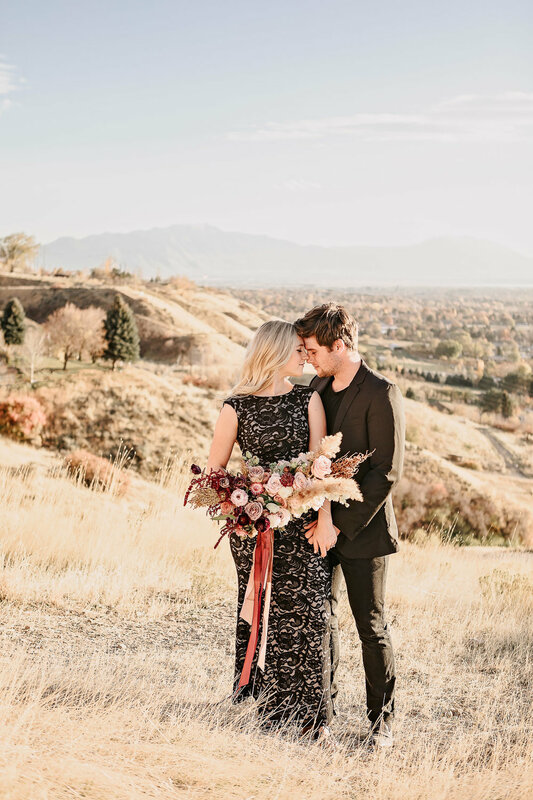 The location she and Dylan selected was one of the most coveted spots in Utah. And you can see why! 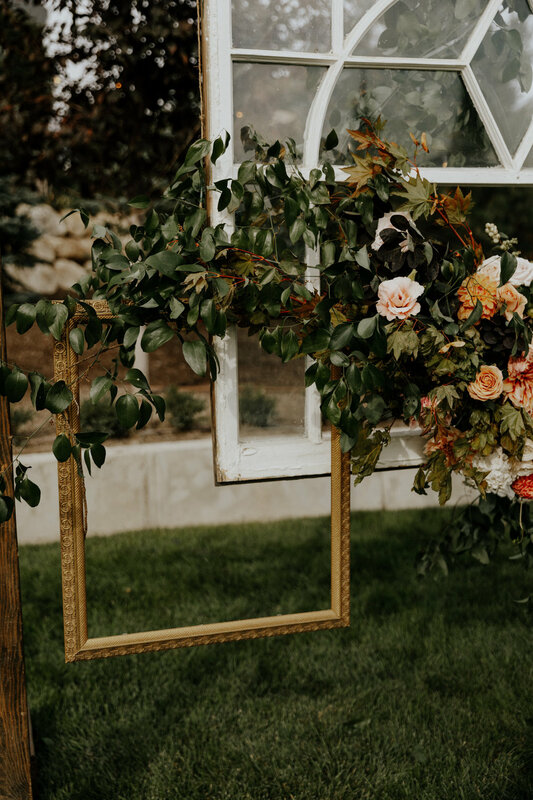 La Caille is absolutely gorgeous with the vineyards, the rockies in the background, and the stunning grounds that make you feel as if you were in Tuscany. Then her gown, that hair piece, her veil, her incredible hair, that flowing ribbon. I just can't get enough of it all and will always hold this one in my mind with so much love. I would be ungrateful if I didn't recognize that these sorts of things take a team to complete. And another huge thanks to my dear friend, Sarah, at Blushing Rose Floral, who pulled off that arch. Isn't it exquisite??? 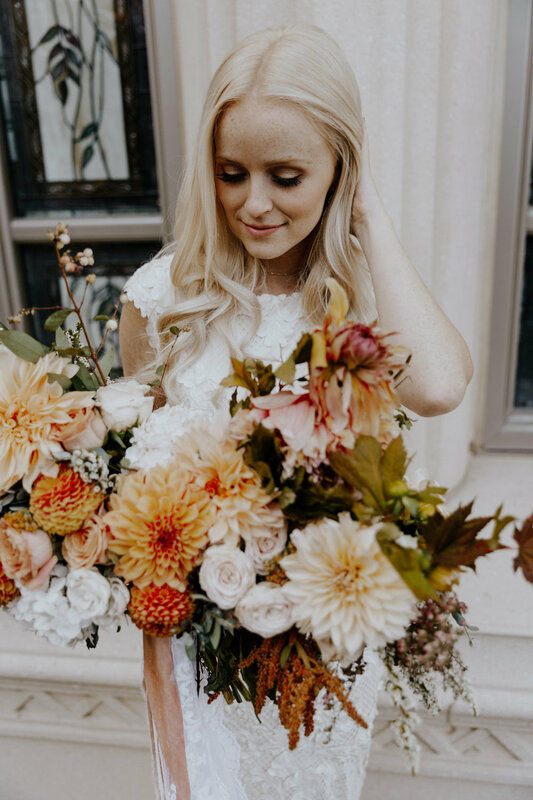 Here's to more spring bouquets in the fall and more fall bouquets in the spring. 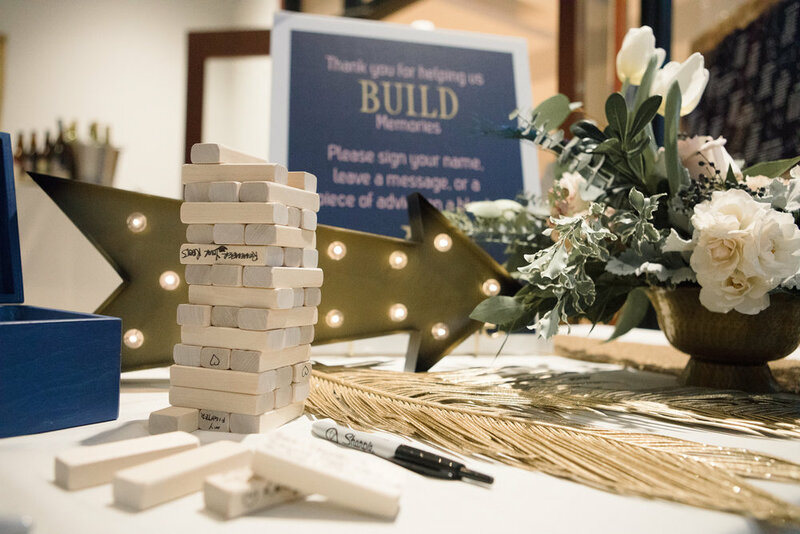 To really stretching our creativity to make the wedding the bride dreams of! And to brides who make it all worth it! Thank you, Delia! Love you! Sometimes it's simply about the beauty of nature in the location. Sometimes it's about enhancing that natural beauty with florals and simply beautiful humans. Sometimes it's about capturing the stillness of the moment. This was one of those times. If you're quiet enough, you can feel it. 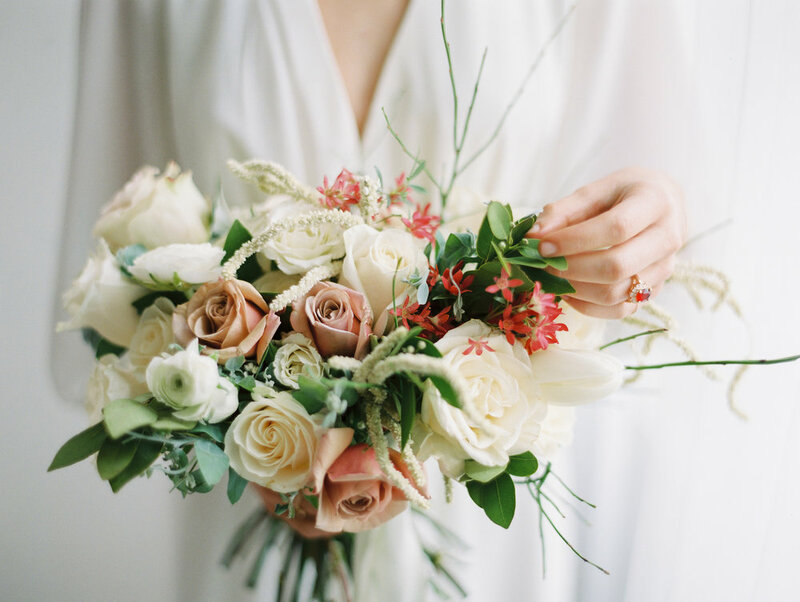 Just because you have a small wedding, doesn't mean you have to go small on a bouquet! 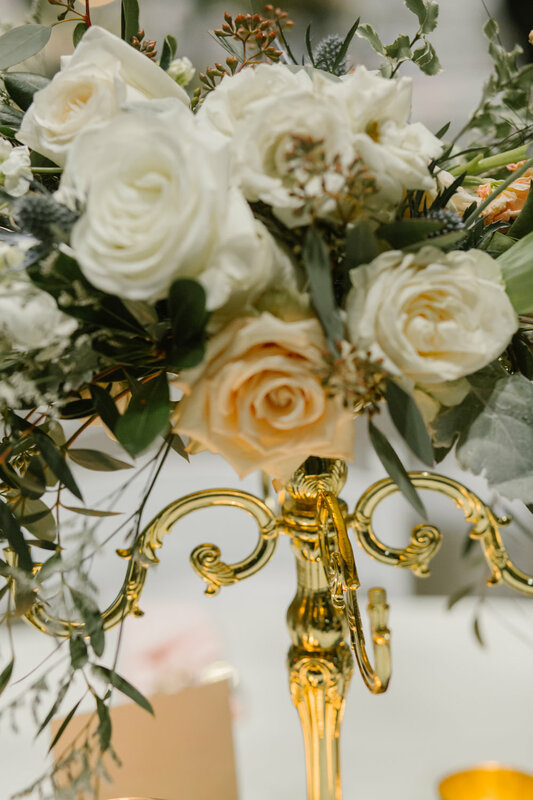 Allie and I worked together, back and forth, this and that for quite some time before deciding that what she really wanted and couldn't live without was a stunner of a bouquet! So literally, that's the one item we made for her. 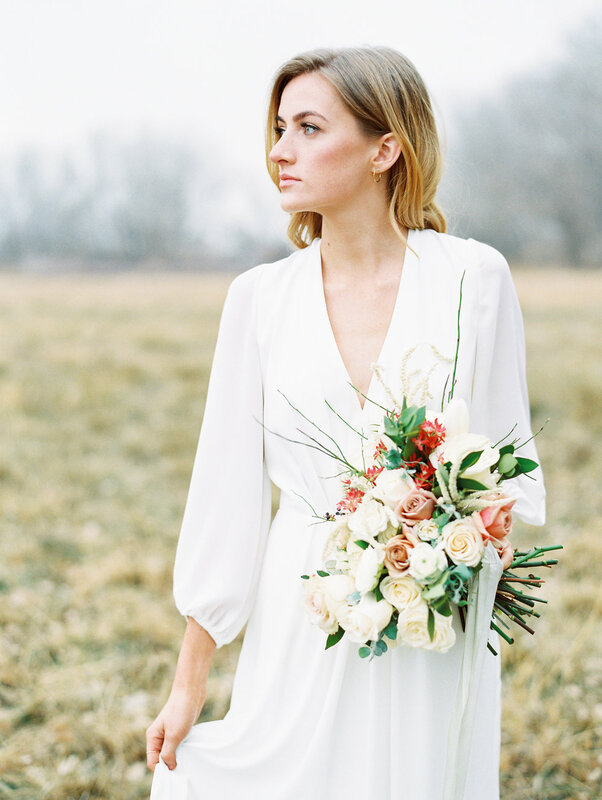 This stunner bouquet! And we didn't hold back either. We probably used every spring flower + all the little extras I could think of to make this bouquet! 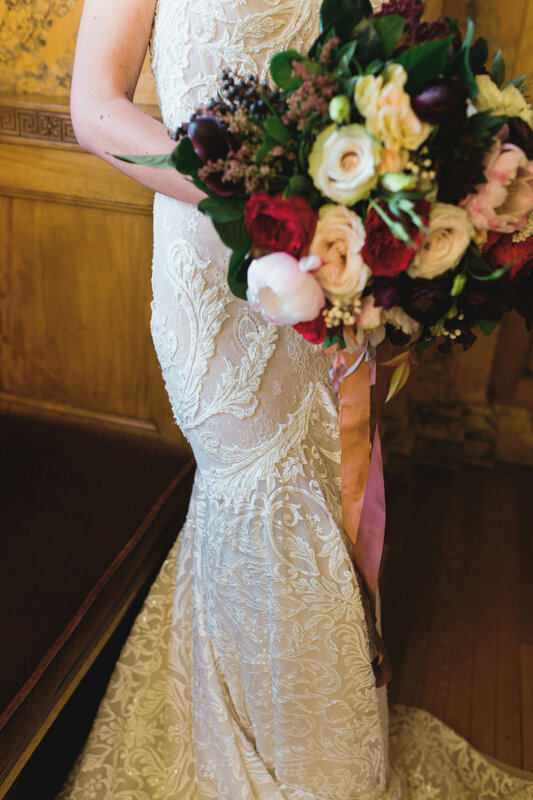 Our goal was to fit a spring mold, let the bouquet make a statement against her gorgeous gown, have it stand out and yet coordinate with her Moab location, and obviously be unique and one-of-a-kind. I'm so pleased with the results and I dare say she is too! 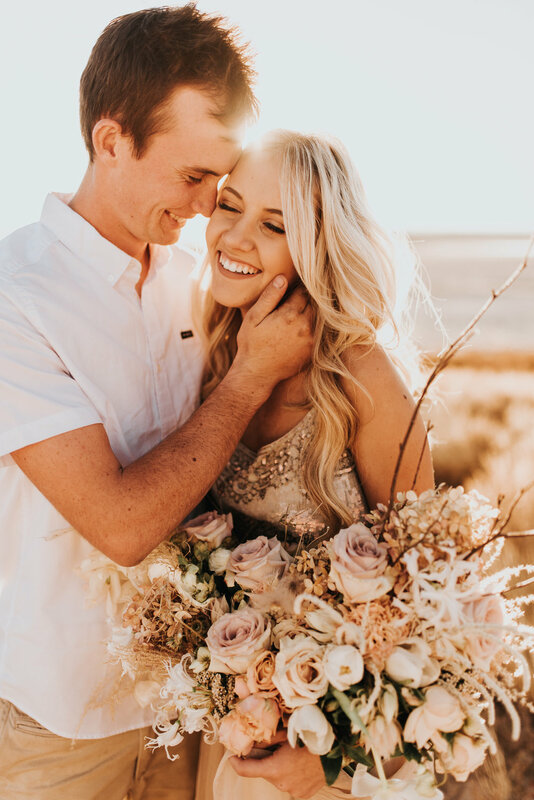 Her reaction to seeing the bouquet was absolutely priceless and something I will never forget! And ps....this is 4 days after we actually made the bouquet! Isn't the way they held up amazing??? And location. I can't get over the location. 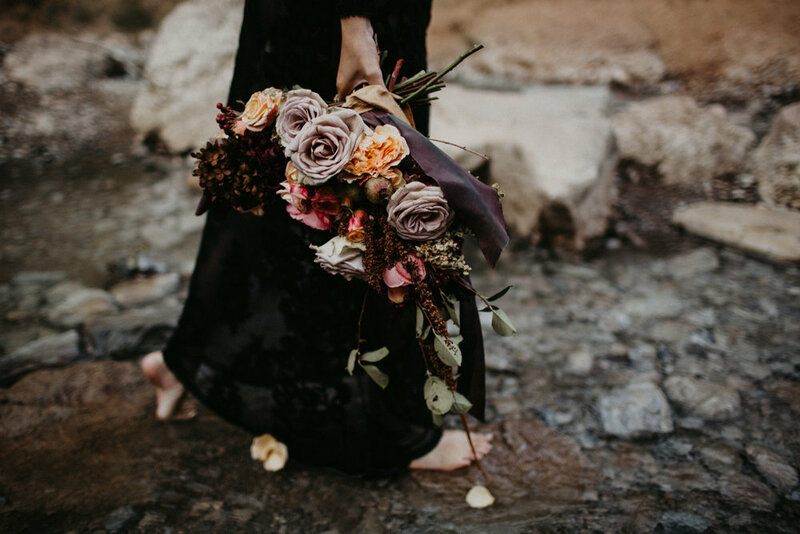 When Kristine asks for a bouquet, you say yes. Every. Single. Time. 1. Because she's the sweetest there is. 2. Because that means she's modeling and she's gorgeous. Just look at that hair!!! 3. Because Luke will be shooting, modeling, or behind the video. And he's the best at video. 4. Because Pippa. Keep looking to see who Pippa is. 5. Because I love them. All of them. I've said it before and I'll say it again. I love the desert. I love the heat. I love the way the sun beats upon the earth. I love the dry weeds and the little bits of green that somehow survive with little to no water. I love how we can grow things in our bit of the desert by modern watering systems, and how the hills go the way of the earth and dry out long before the valley does. I love the red rock and the soil that belongs to it. I love the cracked bits of earth and the way they beg for moisture. I love the tumbleweeds that continue to exist, long after their time has passed. And I love incorporating all of these things into who we are and what we do. This is the world that surrounds us. Embrace it. 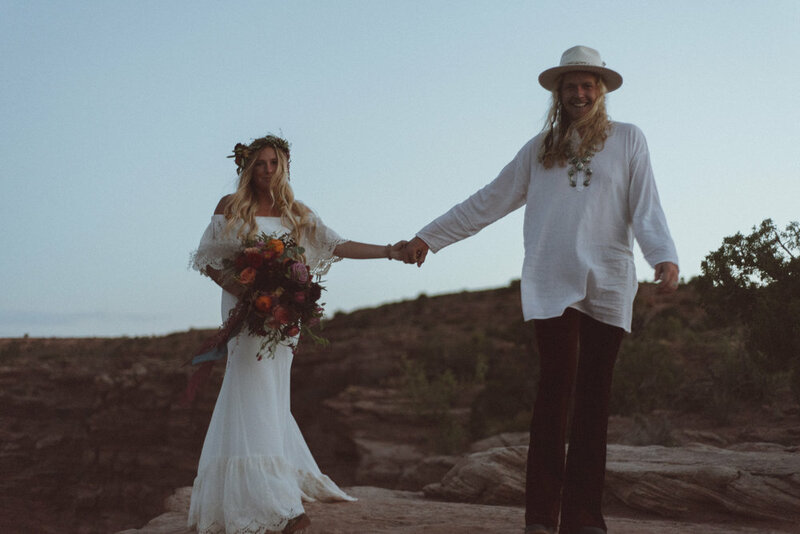 You all know I go a little head over heels for that boho bride who dances to her own beat and hears her own music. 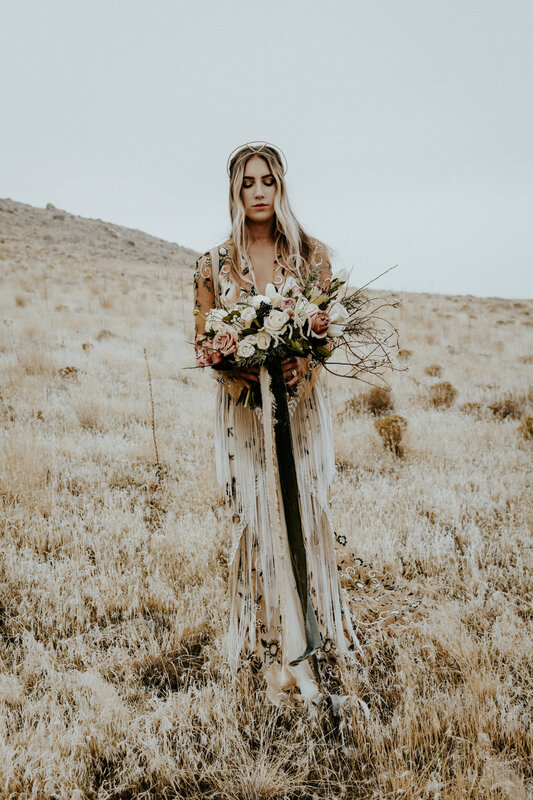 So how could I not jump at the chance to work with this talented team to photograph the ULTIMATE boho dress?! Not wedding you say? I beg to differ! Just because a gown isn't white doesn't mean it isn't a gown! Remember, do you! Be you! If you fall in love with a dress listen to that inner voice telling you this is it! Ignore what the world says. Ignore what others say. If this is really you, go for it! And enjoy every moment of being the princess, the queen, the star of the show in that gown! 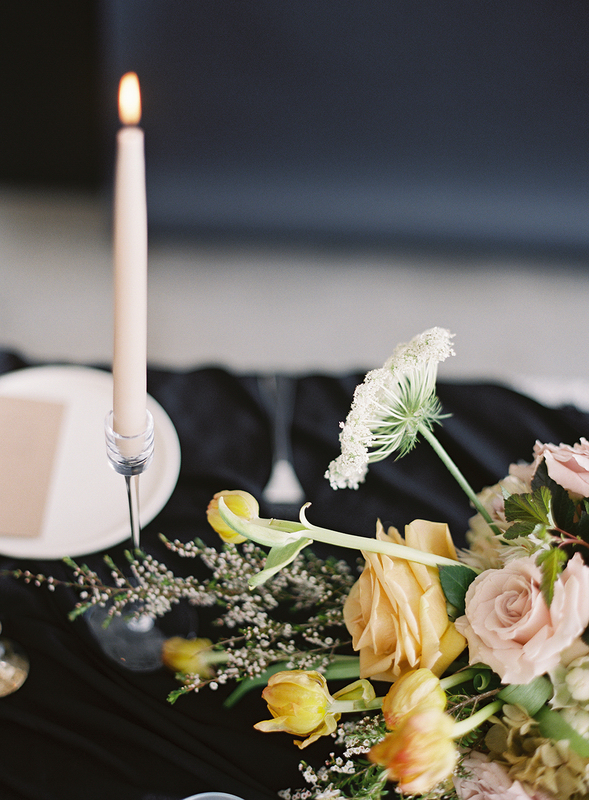 Here's a quick peek at some of the beautiful images captured on this day. 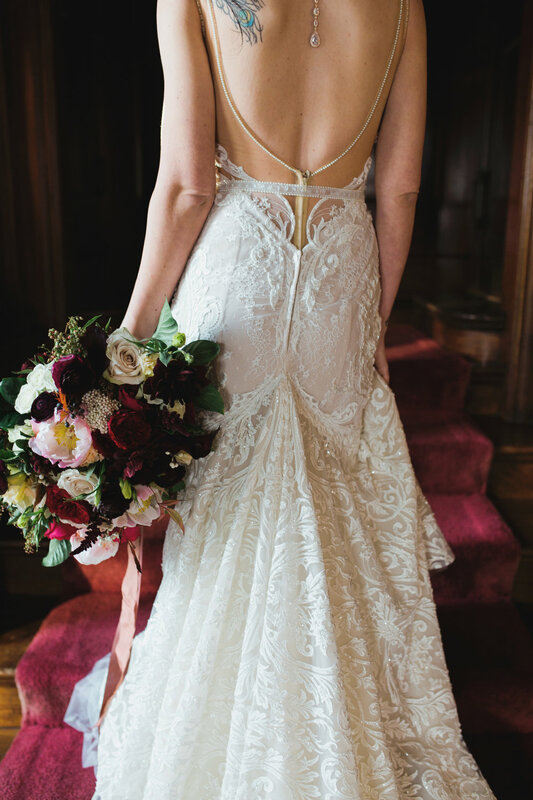 The gown itself makes a statement, but when perfectly paired with the other details, it's a show stopper! What do you think of that crown? Talk about a modern day queen? That crown is it! Soft, natural hair in a half up do accents it perfectly. 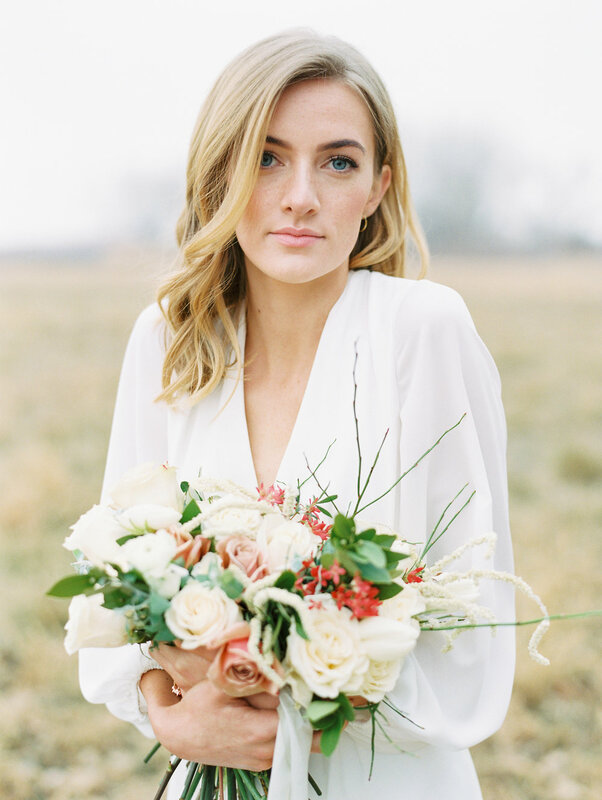 Flawless natural makeup that defines the natural beauty in this bride. 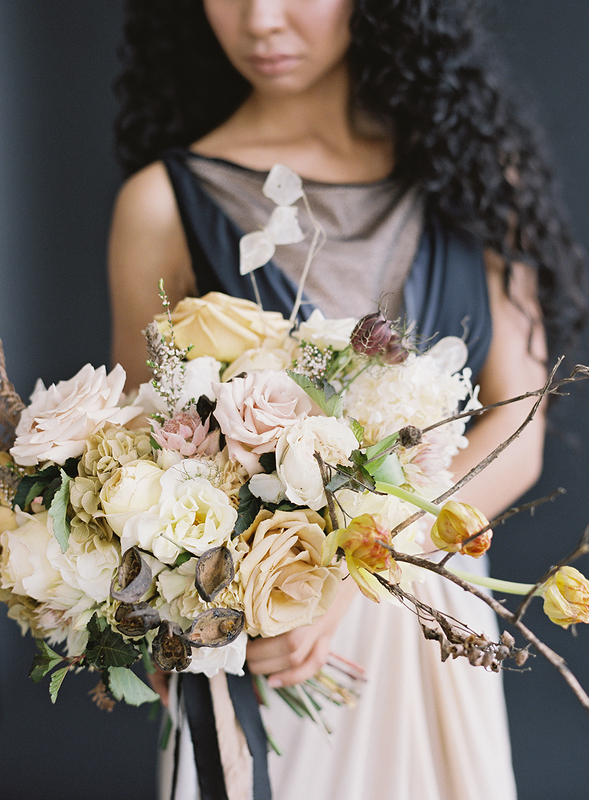 Florals that also make a statement and pull out the tones and detail in that gown. Ribbon. I don't ever think I even need to say anything about ribbon. The setting. Weeds. Rocks. Dirt. A bit of water in the background. A golden sunset. Editing style that knocks these images out of the park. And the most important part, love. It's the winter fog and the soft white gown and those piercing eyes. Oh those eyes! It's the mystery that lurks just beyond the blur of the fog and the deep sea that swims in her eyes. It's the simple romance that makes a woman more beautiful than her features, more beautiful than what meets the eye, more soul and more complete. That's what makes a woman truly beautiful. Her soul. And along with that, sometimes you don't need a large, fancy bouquet. Sometimes you simply need to compliment what already exists and the beauty around you. Let that woman shine. And compliment her with natural beauty. Greenery. It's the thing. It's been on trend for about a year now and seems to be hitting it's peak this year! And oh do we love it! There is so much goodness and depth and texture and shape that comes with greenery. It's unique in it's own way and brings out both a classic style as well as a more modern, boho style. 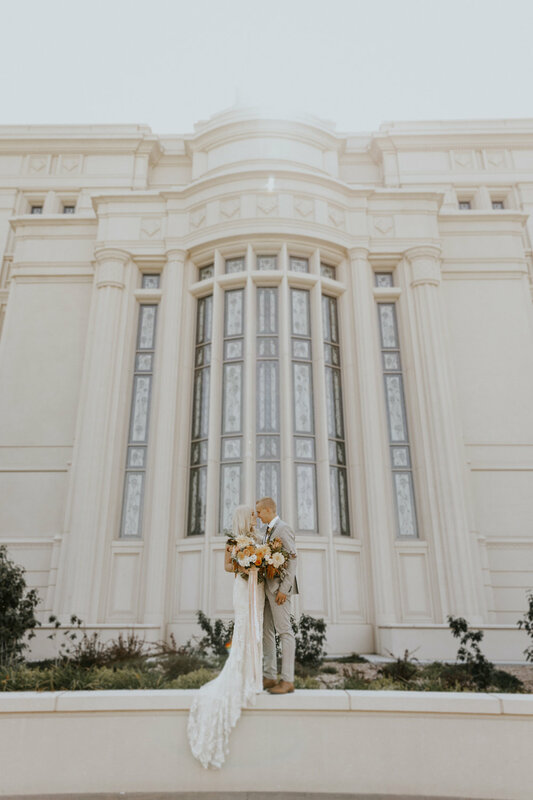 Lundy was one of the most classic brides we have ever met! She wanted clean, textural, simple, and timeless. And she wanted green. So off we went! Her bouquet doesn't actually have ANY flower blooms in it! Do you see that? 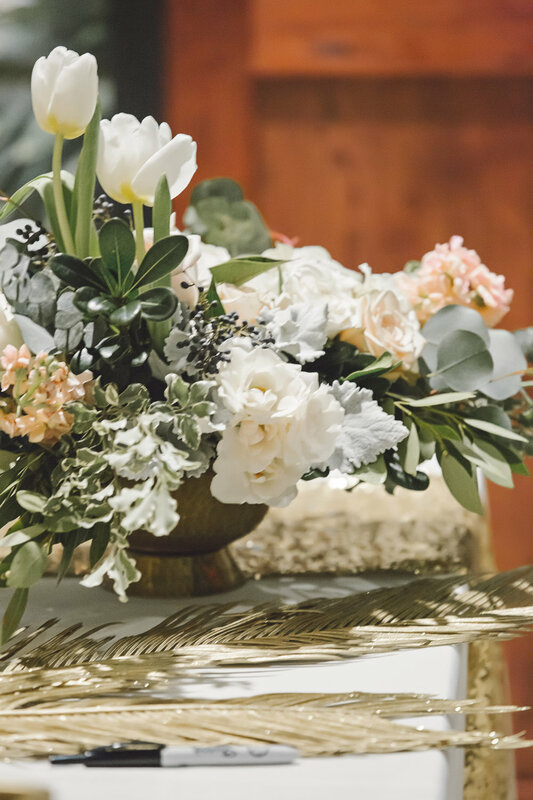 It's all greenery, textural flowers, and what we call filler flowers...meaning they don't have big blooms on them. 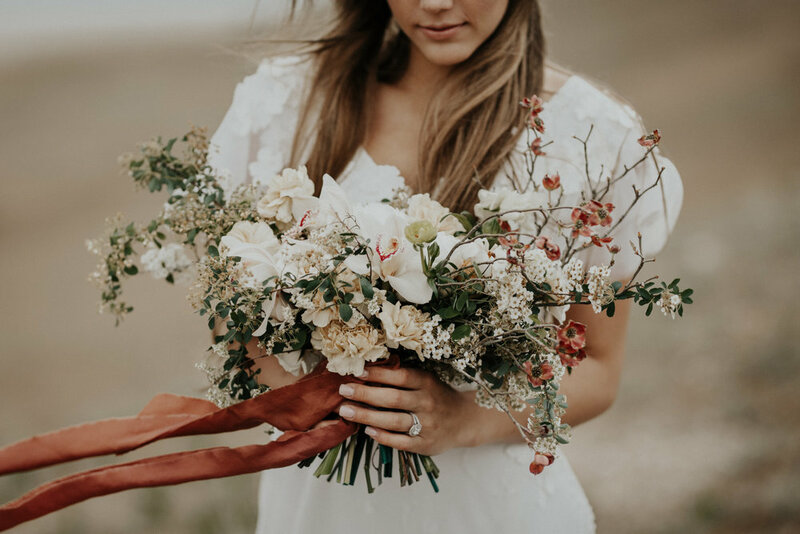 What I love about her bouquet is the depth and range of texture in it! So I know you're asking yourself, what? No flowers? But do you really think they're necessary? 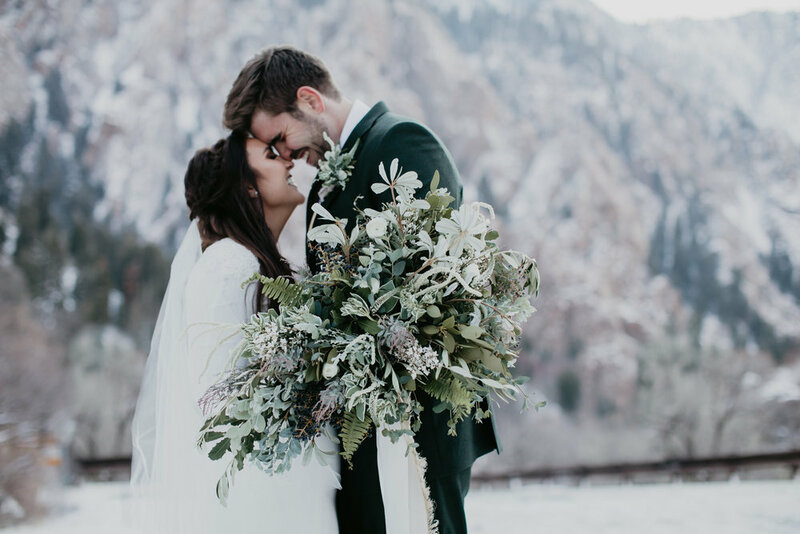 Give us some fern, a bit of eucalyptus, acacia, holly, pitt, snow on the mountain, desert yearning, privet, veronica, olive, bay leaf, and scabiosa pods and we are more than happy! 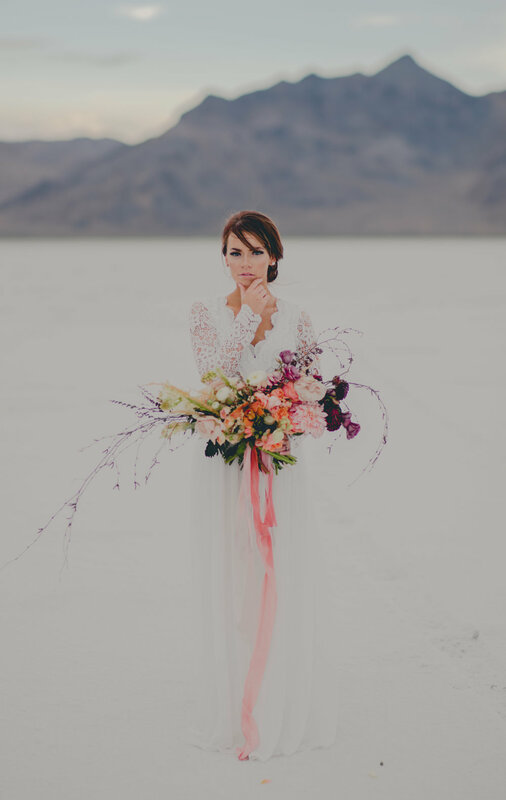 There is so much to look at that we don't even miss the focal blooms!!! Besides the fact that Lundy's eyes are the impeccable match to the green. Take a look! She has THE most gorgeous eyes! We're all about that bout too! It's textural, it's simple, it's manly and stately. It's classic. But not boring. It's what our grooms are asking for! None of the focals and all of the texture! And finally, ribbon. Gold velvet ribbon. Classic. A Night Under The Stars began with the inspiration from Picasso's "Starry Night". When Mallory first came to me, she had already pulled some of the tones from the painting and added in her own personal preference of blush and white. 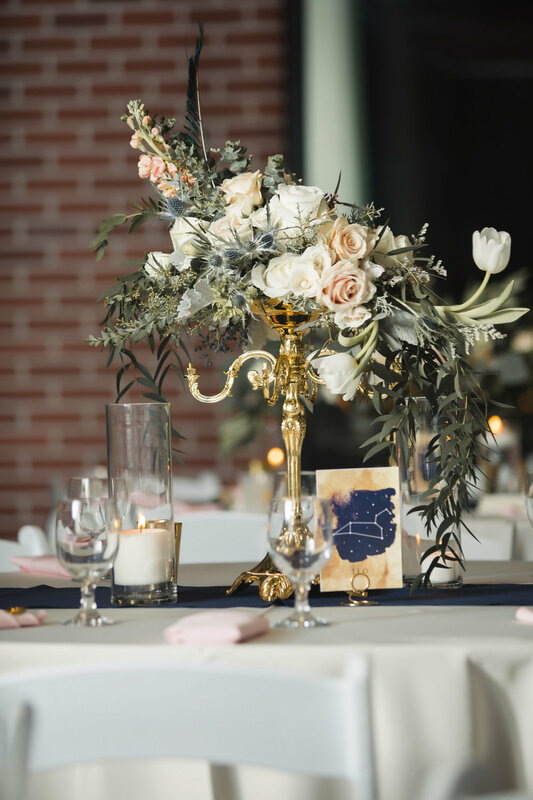 And so the romantic starry night color palette included the deep night navy blue, the teal and gold tones of the setting sun, and that light blush...representing those first bits of light shining on a new morning. And not only did the color palette reflect a night under the stars, but guests were literally seated under the stars. No, not outside in the freezing winter weather. 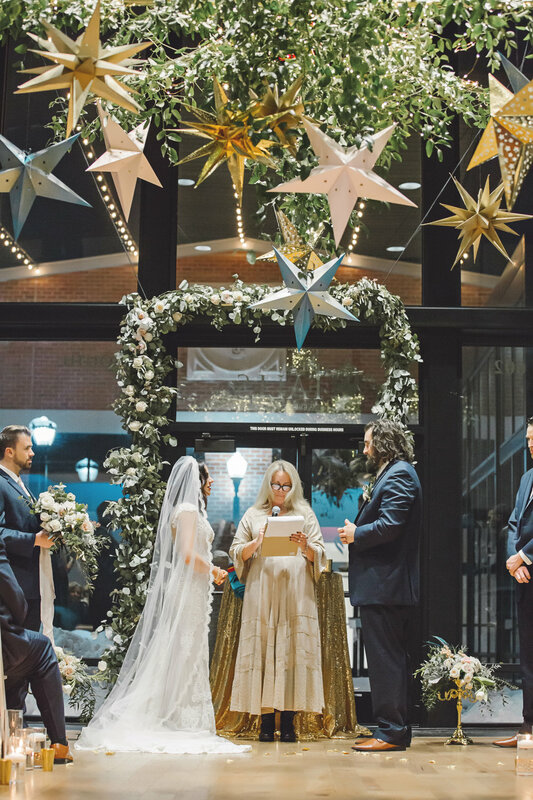 No, the ceiling installation, built and hung on a 25' ceiling, gave a romantic, magical mood to the entire room. And those twinkle lights brought the cool winter night indoor. 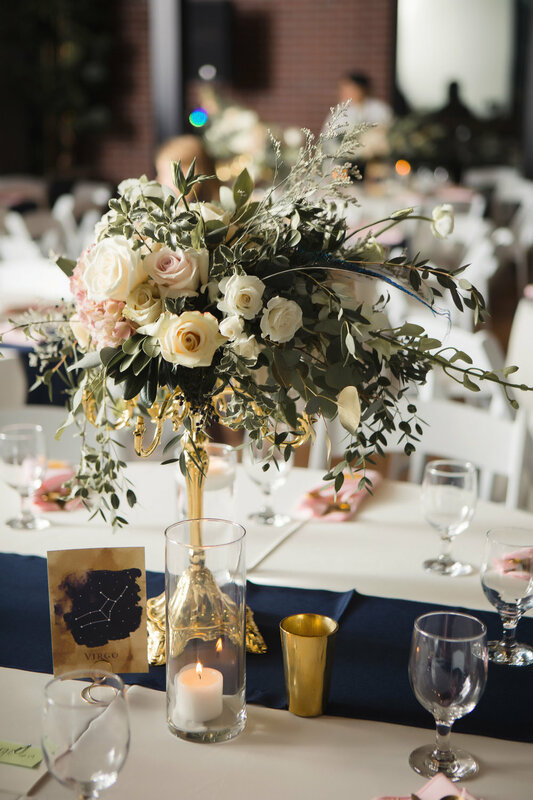 The massive centerpieces sent this wedding over the top! As if a huge ceiling installation wasn't enough, we met it's majesty with 25 of the largest arrangements, stunning the guests whose oohs and aahs were audible. It was a sparkling, starry dream, A Night Under the Stars, a magical creation, all taken from the inspiration of a painting and a name. Love doesn't always look the way we imagine it. Love isn't always found in the obvious places. Love is unique to each one of us an this couldn't be more true of Sydney and Dustin. The look on their faces, the glow in their eyes, the mutual respect between them, was more than I could bear on that day. It's these types of couple and their love that give me far more than I could ever give them. Knowing these people and seeing the way they live their lives has only enriched mine. Thank you, to both of you. I'll never forget you! When you wish upon a start (then work for it), dreams do come true! I've wanted to work with the talented Kandice Breinholt for as long as I can remember. But to be honest, she felt untouchable, far out of my reach. She was one of those creative that was beyond me simply because she was so good at what she does. But I worked. I learned, I grew and as I did, continued improving my art. I dared to let Kandice know that I wanted to work with her. I set that little bug out there for if and maybe and when. And I kept working. Then one day she asked..."I have a personal project", she said. "One for which you'd be perfect." And then she told me all about her vision. 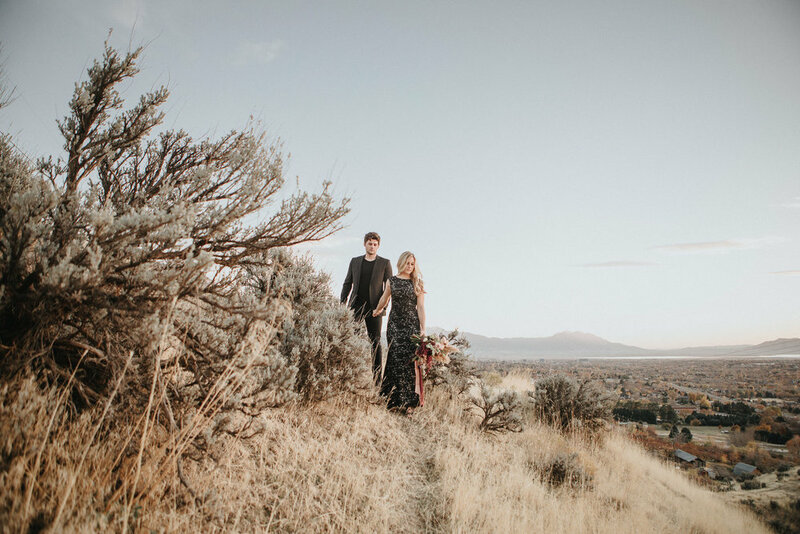 And elopement featuring some of my favorite people in front of the camera this time (Haley Nord) and a location that's only found in your dreams. Or in 8 miles off any road in Southern Utah. Well the dream came true. The images speak for themselves. And I learned to keep working. To voice my dreams. And to work some more. Each time I feel I lose my way or when I feel too overwhelemed, unfocused, and "stuck" in the busy day-to-day, these are the images that bring me back to my center. These are the words that resonate in my soul. At the beginning of each year I carefully choose a word, or a phrase, that defines my hope, my focus, my attention for the year. 2018 is the year of "live richer". I know you're now wondering why a tabsescape void of rich food, extravagent plating, and that feels almost empty would represent living richer. Living richer this year, for me, does not mean more. It means less. Less distraction, less pressure, less busy. It means more being present, more hands in the dirt and the dough, more breathing in the fresh air, more laughter, more play. More living in the moment. And it means more saying no. So this table represents a meal full of the simple things in life, void of distraction, and full of love, life, and living richer. So you're invited. Come to my house. We'll bake bread. And we'll laugh. We might play with flowers. And most of all, we'll be present. That dogwood though. Enough said.